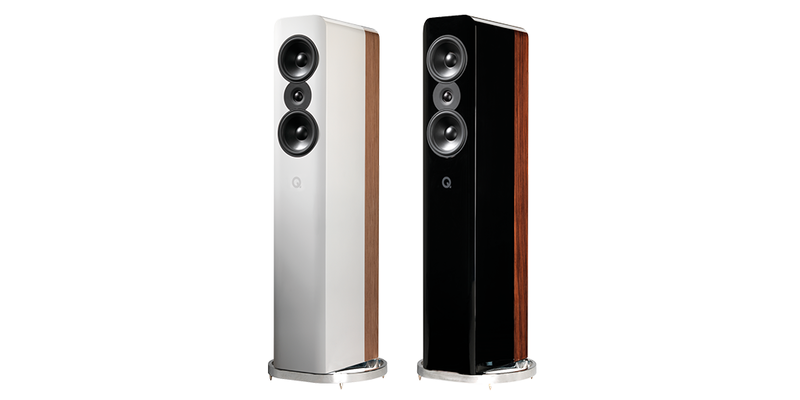 An ambitious floorstanding speaker sets new standards at the price, thanks to clever design and meticulous tuning. We’re probably all familiar with the idea of ‘trickledown’ design, in which technology is launched in an upmarket product, thus covering a good chunk of the research and development costs, then eventually finds its way into more affordable models. What we have here, however, is something rather different: ‘trickle-up’ technology, in the form of the elegant Concept 500 loudspeakers from Q Acoustics. Not only are these floorstanding speakers the most expensive speakers the British-based company has ever offered for sale, at £3995 a pair, they’re also by far its most ambitious design. This is definitely terra incognita for Q Acoustics, which after all started as a manufacturer of inexpensive speakers designed to take on the likes of budget models from Mission, KEF, Tannoy and the rest. That was 10 years ago, since when the company, part of Armour Home Electronics, has been on something of a winning streak. It’s picked up awards for just about every product it has launched, and has expanded its offering to a comprehensive line-up encompassing four complete speaker ranges, media soundbar solutions and even a number of custom installation products. But the new model is a giant leap upmarket, not to mention a major statement of intent and ability by the Woking company. And that ‘trickle-up’ technology? Well, there’s quite a lot of thinking carried over, albeit in an enhanced form, from the more affordable models. That’s hardly surprising, given that the design team has been together from the start of the project more than a decade ago. The company brought on board some very respected talent, including industrial designer Keiron Dunk, who set the look of the whole Q Acoustics range, and speaker designer Karl-Heinz Fink. The launch of the speakers at Armour’s Woking HQ late last year saw this design team ‘breaking cover’ – at least officially – for the first time, and the speaker they’ve all come up with is something pretty special. The Concept 500 uses the GelCore cabinet construction developed for the Q Acoustics range, in which layers of MDF sandwich a gel designed so it never sets, thus damping out resonances in the by turning unwanted energy into heat. For this new, more advanced design, a Dual GelCore construction is used, with three layers of board and two layers of gel for even greater damping, not to mention the greater stiffness afforded by the thicker material. The cabinets use P2P (point to point) bracing to stiffen them without the undesirable effects of more conventional global bracing, this being developed using computer modelling and Finite Element Analysis, while within there are Helmholtz Pressure Equalisers to damp out pressure variations within the enclosure. The enclosures sound unusually ‘dead’ when rapped with the knuckles – it’s a hi-fi reviewer thing! – and the company says that the construction and bracing design combine to reduce cabinet noise by 30dB, which is pretty significant when it comes to lowering coloration, thus enhancing resolution and imaging. While the drive units are relatively conventional – two 16.5cm mid/bass units straddling a 28mm done tweeter – both have been developed specifically for this model. The larger drivers are mounted to one of the internal braces using a self-tightening spring-loaded system, while the tweeter has been designed for wide dispersion, increasing the ideal listening ‘sweet spot’. A large rear port tunes the bass, with two-part foam bungs being provided to adjust its effect. The terminals are mounted low down while a panel higher up locates the crossover and provides a +/-0.5dB adjustment of the tweeter level and the whole speaker sits on a skeletal plinth, which stabilises the column. After spending some time adjusting the setup of the speakers, I settled on a slight toe-in to firm up the image, the tweeter set to ‘flat’ and used without the bungs, as this gave the best overall balance. However, should you have to use the speakers close to a rear wall or corners, or have a room prone to bass reinforcement, use of either the outer foam ring or the whole bung with the central part in place will help tame the bass, albeit at a slight cost to the midband presence. I mentioned ‘the best overall balance’ but that’s selling the Concept 500s short: in fact these speakers sound entirely spectacular when driven with high-quality amplification, which in my case ranged from an all-in-one system from German manufacturer AVM to my usual Naim pre/ power combination. And what became clear very quickly was that these speakers have a ‘rightness’ about their sound that’s just as satisfying as their ability to turn on the sonic fireworks when required. You don’t have to drive them hard to hear them at their best: even at low listening levels their superb imaging, broad and deep sound-staging and unforced tonal balance are much in evidence. The speakers are easy to drive, thanks to 90dB/W/m sensitivity and 6 ohm nominal impedance with a 3.7 ohm minimum, meaning you don’t need huge amplifier power to get them singing, but it’s worth using high-quality electronics upstream of them, so transparent do they sound. What I really like is the way they reveal so much about the timbres of instruments and voices, whether with an intimate recording of solo instruments or small ensembles or much larger-scale works. The recent Sir John Eliot Gardiner recording of Bach’s St Matthew Passion (SDG, 4/17) sounds magnificently dramatic and rich via these speakers – so much so that I had meant to dip in just to see how they handled it and ended up listening to it straight through in one sitting. The measured heartbeat pulse, the interplay of the two orchestras and choruses, the performances of the soloists – all spring from the speakers into the room in an entirely captivating manner. It’s that ability to create a realistically scaled sonic picture into which one can listen in as much detail as one wants, while still delivering a great sweep of sound, that makes the Concept 500s so appealing. It’s the kind of sound I’m used to hearing from high-end speakers driven well; and while these speakers aren’t exactly mass-market at £3995/pr, I can’t help feeling that to better them you’d have to spend a lot more money. I’m thinking of the likes of the Focal Sopra series or even Bowers & Wilkins 800 Diamond Series here, as speakers able to deliver the kind of unfettered enjoyment and levels of information available from the Concept 500s. Look up the price-lists for those models, and you begin to realise just how much of a bargain this new Q Acoustic model is. Playing a couple of recent Linn releases – the Royal Academy of Music Manson Ensemble’s recording of Stravinsky’s The Soldier’s Tale under Oliver Knussen (3/17) and William Carter’s ‘Bach Reimagines Bach’ (5/17) – extended my admiration for these very special speakers. The Stravinsky sounded wonderfully close and warm, with well-balanced voices and instruments, while the ability of the Concept 500s to ‘play it small’ with the solo strings of the Carter set was just as impressive as their ability to deliver scale and power. Yes, the speakers are undoubtedly a brave move by this British-based brand – but they also have the wherewithal to be just as disruptive in the high-end as the company’s original products have been in the mass-market sector. As mentioned in the review, this is an audacious move by Q Acoustic, catapulting it into the price range where the well-known speaker names start concentrating on all-out performance rather than building down to a budget. So the Concept 500 speakers are hardly without competition, being challenged by the likes of the PMC twenty5.23, at £2970 comfortably less expensive. With the familiar PMC ‘slanted back’ design and a port design inspired by Formula 1 airlow management, they sound big and forceful, while at the same time delivering plenty of detail. The same kind of money will also buy you KEF’s R900 speakers, with a similar driver arrangement to the Q Acoustics one, except here the two bass drivers lank one of KEF’s UniQ coaxial drivers, combining treble and mid-range in one assembly. The result is a speaker with extremely good focus and sound-staging. If you fancy a less expensive speaker that can deliver a big sound, look no further than the excellent Bowers & Wilkins 683 S2. It’s a conventional design, with a tweeter for the treble, a Kevlar-coned mid-range and a pair of bass drivers and, while the design and finish are rather more plain than that of the Concept 500, it’s hard to argue with the value for money on o er here at around £1150.